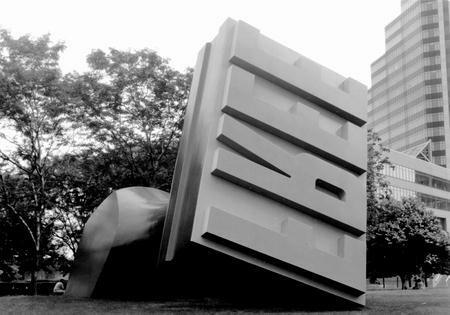 In 1985, Sohio's new headquarters on Public Square yearned for a grand adornment outside. The CEO contacted acclaimed sculptor Claes Oldenburg and his wife Coosje van Bruggen to design a sculptural element for their building. Thus, the Free Stamp was born. 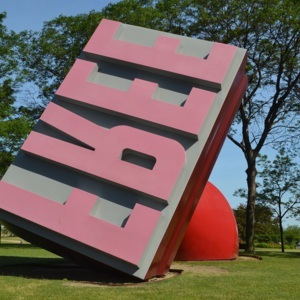 The husband and wife pop-artist duo created a massive rubber stamp with the word "FREE" emblazoned on its pad. The sculpture was to stand upright, with the words against the ground, on a pedestal that was being installed right outside the front doors. All was running smoothly until BP bought out Sohio and subsequently cancelled all plans for the Oldenburg work. BP, a British company, had negative associations with the Pop Art movement due to its infamous reputation overseas, so they wanted nothing to do with two most renowned pop artists alive. On top of that, they felt the "FREE" on the bottom (which would have been against the ground anyway) was slyly referencing Sohio's recent loss of freedom, and was just too generally critical of the bureaucratic system. Thus, the disassembled Free Stamp went into storage in Kankakee, Illinois where it was fabricated. For years, there were attempts to grant the stamp to the city as a gift, all of which were thwarted by then-City Council President George Forbes. But once Forbes lost his position in the next election, the stamp was graciously accepted. 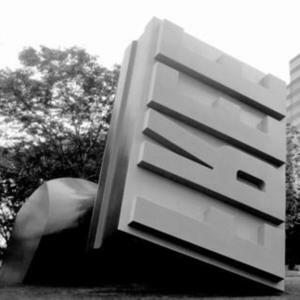 The city proposed Willard Park as an alternate location for the sculpture and the artists agreed... but they had to make some modifications first. 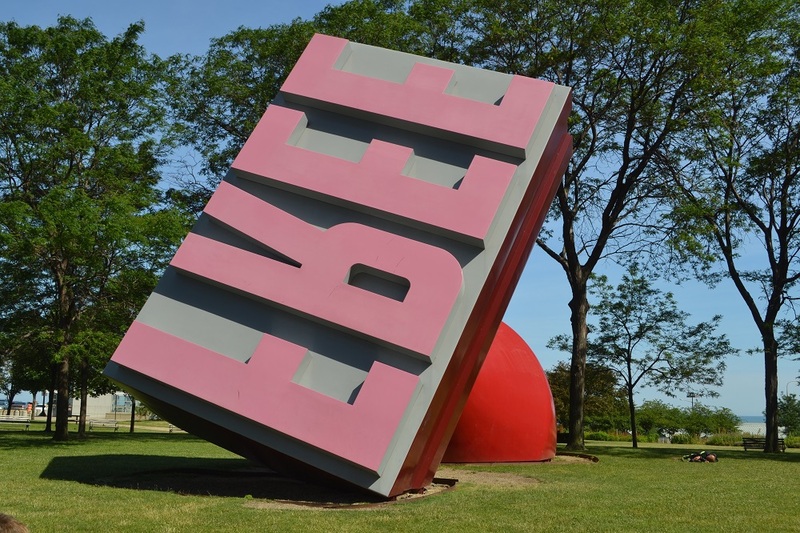 They decided to put the stamp on its side, with the bold, geometric forms of the word "FREE" running backwards in direct view of the passing public. 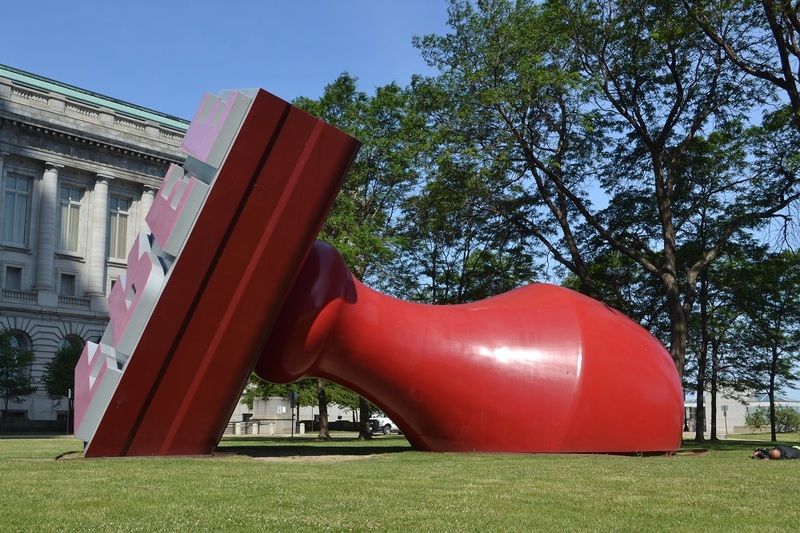 Oldenburg and van Bruggen wanted the piece to look like a Divine hand had picked it up from its pedestal on Public Square and haphazardly flicked it away into Willard Park. The pad is pointed right towards the BP tower, specifically aimed at the 43rd floor where the Board of Trustees meets, hearkening back to its old pedestal and calling out the people who tossed it aside. They placed it on the corner nearest to City Hall and Lakeside Avenue so that it attracts as much attention as possible and also because that seemingly arbitrary positioning adds to the narrative of the piece being thrown. 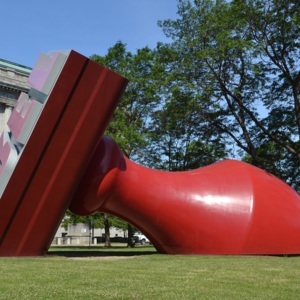 Ed Olszewski Ph.D. in Art History and Professor Emeritus of Art History at Case Western Reserve University notes that the controversy surrounding the piece's installation combined with the text it bears serve as an almost self-fulfilling prophecy; the stamp is Free from corporate ownership, free from association with any business, and free to make a name for itself. Even more interestingly, Olszewski explains that now, the viewer becomes a blank sheet of paper for the stamp to imprint its word upon every time they turn the letters around in their head. 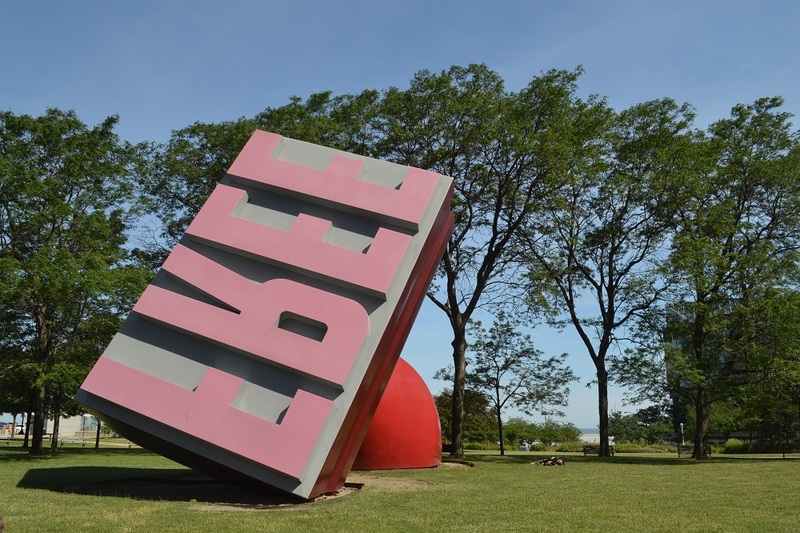 : Claes Oldenburg and Coosje van Bruggen, “Free Stamp,” Ohio Outdoor Sculpture Inventory, accessed April 18, 2019, http://oosi.sculpturecenter.org/items/show/159.